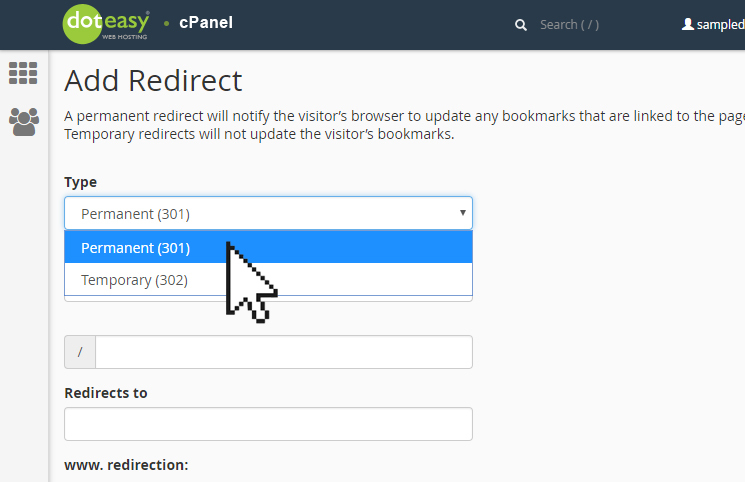 Under Add Redirect, select the desired redirection type: Permanent or Temporary. 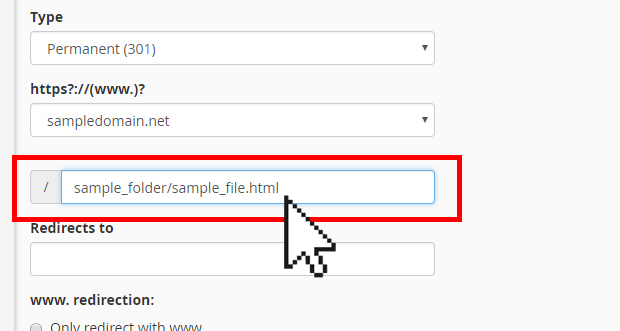 Select the domain from the https://www. drop-down menu. Select the desired www.redirection option. Only redirect with www. – this option only redirects visitors who enter the www. prefix before the domain name part of the URL. Redirect with or without www. – this option redirects all users, regardless of whether the visitor enters www. prefix before the domain name part of the URL. Do not redirect www. – this option does not redirect users who enter the www. prefix before the domain name part of the URL. 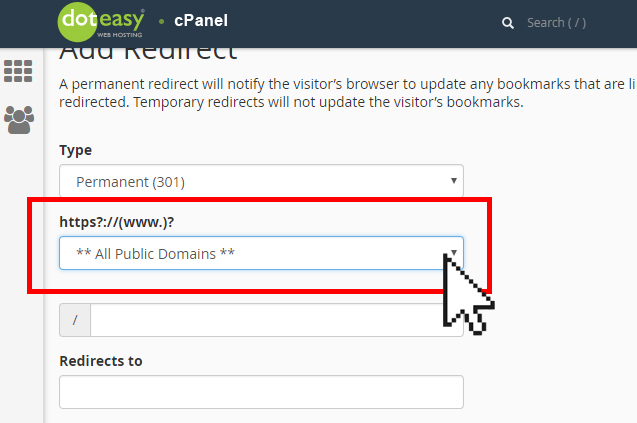 Select the Wildcard Redirect option if you want to redirect all fines within a directory to the same filename in the new directory. To a website visitor, a permanent and a temporary redirect work the same way. But they aren’t the same as far as search engines are concerned. Search engines handles them differently. A permanent, or 301, redirect means that the page has permanently moved to a new location. A temporary, or 302, redirect means the move is only temporary. Search engines need to figure out whether to keep the old page or replace it with the one found at the new location. Say you have moved your website to a new domain. If you used a 302 (temporary) redirect, your website visitors will be redirected, but search engines see it as a temporary redirect and will continue to index your old, outdated URLs. However, when you use a 301 redirect, it will request search engines to update the URL in their database, thus changing the URL of your page when it shows in search engine results.